The National Register is the nation's list of historically significant cultural resources. Maintained by the National Park Service, it recognizes buildings, archeological sites and other historic resources that are significant not only nationally, but also regionally and locally as well. 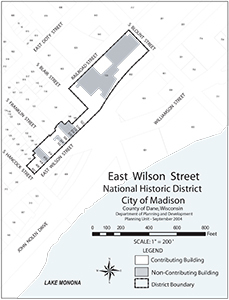 As of this writing, there are over a dozen historic districts and over 75 individual properties in Madison listed on the National Register. 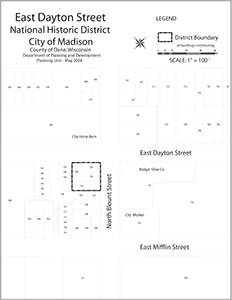 Please note that there are two types of historic districts in Madison, the local districts discussed elsewhere on this site and the National Register districts discussed here. Although some local districts are also listed in the National Register, the program requirements of the two programs are not the same and there are some differences in boundaries. The major effect of listing on the National Register is financial incentives in the form of two kinds of tax credits; one for the rehabilitation of income-producing property and one for the rehabilitation of single-family residences. Visit the Wisconsin State Historical Society website for more information about these tax credits. The three buildings in this district, clustered at the corner of East Dayton Street and North Blount Street, represents the last remnant of Madison's first African-American enclave. All the buildings in the district were moved here from elsewhere in the City. Prior to the Civil War, very few African-American families lived in Madison, and those who did lived in rented housing and held odd jobs. Most of their histories were never recorded. By 1900 there were nineteen African-American households in the City and twenty-five African-American working men and women. Three African-American families owned their own homes, including John and Martha Turner who came to Madison from Kentucky in 1898. The Turners organized the Douglass Beneficial Society, a self-help group for Madison's African-American families, and moved a building to 649 East Dayton Street to house the activities of the Society. The Turners were also instrumental, along with William Miller, in organizing the first African-American church in Madison. Around 1903, the group purchased a former Norwegian Lutheran church and had it moved to 631 East Dayton Street (no longer extant). The establishment of the beneficial society and the church, combined with active encouragement from the Millers and the Turners, induced several other African-American families to move to the neighborhood. In 1910 three of the six black homeowners in Madison lived near the corner of Dayton and Blount, and nineteen of the thirty-nine black households were located in this area. In nineteenth-century Wisconsin, the railroads were the highway system of the day, making railroads the dominant catalyst for economic development. Farmers,manufacturers, and virtually all other producers of goods depended on the railroads to get their products to urban markets to the east. Railroads were also the main form of long distance travel and migration, and local commerce benefited from passenger train traffic by concentrating businesses around depots where travelers would disembark. Around 1870 two railroads built passenger depots in the Wilson Street area – the Chicago and Northwestern Railway and the Milwaukee Road. Three other rail extensions to other areas of the State passed through these depots. During construction of the depots, a concentration of small businesses sprang up along Wilson Street to take advantage of the dramatical ly increased traffic in the area from railroad passengers arriving in Madison, railroad employees, and vendors delivering shipments to trains. A Prussian named Herman Kleuter was one of the first businessman to profit from the depot traffic. He opened a grocery store in 1867 on the 500 block of Wilson Street Then, in 1871, after business had increased, he built the two-story brick building that now stands at 506-508 East Wilson Street. Other Madison entrepreneurs built hotels and commercial buildings in the area, and merchants opened saloons, restaurants, grocery stores, tobacco shops, and barber shops. After World War II, rail traffic declined, and with it, the Wilson Street commercial area. The last Milwaukee Road passenger train left Madison in 1971. Mendota shoreline on the north to the rear lot lines on the south side of Gorham Street. Settlement of the ridge was initiated in the early 1850s, but proceeded slowly. The Leitch House built at 752 East Gorham Street in 1857, is perhaps the finest example of residential Gothic Revival in Wisconsin. At the time, the ridge was perceived as being inconveniently remote from downtown, which was concentrated around the Capitol Square. In the 1890s, when new industries were attracting more people to the City, a streetcar was laid just three blocks from the ridge, and the sparse neighborhood experienced a surge of settlement. By 1900 most of the original lots were occupied. Subdivision of these lots after 1900 increased the density of the neighborhood and allowed construction of many houses in early 20th-century styles. This area retains its pre-World War II appearance and scale despite profound changes that have altered the City since the war. It retains some of the City's best examples of early twentieth century house styles in cluding Italianate, Queen Anne, Shingle, Bungalow, American Four square, Craftsman, and Prairie style, and features designs by several of Madison's twentieth century master architects, including Claude and Starck, Cora Tuttle, Henry T. Dysland, and Frank Riley. The Jenifer-Spaight historic district consists of a historic residential area that occupies a three-block-long by two-and-a-half-block-wide triangular stretch of land in the middle of the larger Third Lake Ridge local historic district. As with the larger Third Lake Ridge area, the Jenifer-Spaight district contains houses that were built in Madison's pioneer era and examples of residential styles from then until the Great Depression. In the first decades of Madison's existence, the western part of the Jenifer-Spaight historic district saw a significant amount of residential construction. Good examples of this early time that remain include Hyer's Hotel, built in 1854 (854 Jenifer Street). the Sauthoff house of 1857 (737-739 Jenifer Street), and the Shipley house of 1854 (946 Spaight Street). During Madison's boom period at the turn-of-the-last-century, most of the empty lots were filled in with houses built in the styles popular at that time, including Queen Anne, Craftsman, Prairie, and Four-Square. 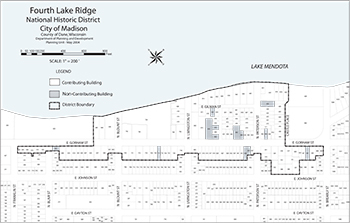 The history of the district is the same as the history of the larger Third Lake Ridge historic district. This area, along with the Orton Park district, have been listed in the National Register because a larger percentage of the houses in these blocks area have been sensitively rehabilitated over the past two decades than in other parts of the district. It is only a matter of time before other sections of the local district become eligible for the National Register. The Langdon Street historic district is a rich tapestry of architecture and history. It began as a spacious residential neighborhood for some of Madison's most prominent nineteenth century families. It emerged in the twentieth century as the university student enclave it is today. The district's historic buildings reflect the many changes in the neighborhood as it grew and developmed over the last 150 years. 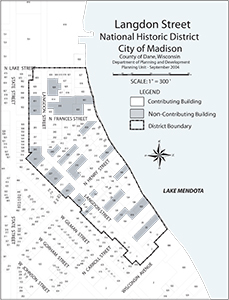 In 1986, the Langdon Street historic district was listed in the National Register of Historic Places, a recognition of the contribution this neighorhood makes to Madison's historical and architectural resources. The Marquette Bungalows is a cohesive grouping of bungalow houses on two blocks just south of the O'Keefe/Marquette School complex. The boundaries are Spaight Street on the north and Rutledge Street on the south, S. Dickinson Street on the west and S. Thornton Avenue on the east. In 1924 the Karrels Realty and Building Development Company platted the blocks as the Soelch's Subdivision. In that year, they built five homes on the lots and continued to build several houses each year until 1930, when the last of the 47 houses was completed. The bungalows share similar sizes and shapes, with a myriad of different details to distinguish each house. Although the houses were not large, the quality of construction and detailing were high; many of the houses had wood floors, fine woodwork, built-in cabinetry and leaded glass windows. At the request of neighborhood residents, the Marquette Bungalows were designated as an historic district in 1993. Beginning around 1890, Madison experienced major population growth, thanks to the growing stature of the University of Wisconsin, the growth of jobs in the state government and the growth of Madison's industrial sector. The population density grew to the point that the traditional quality of life in the downtown area deteriorated as houses were squeezed between older ones and new apartment buildings and flats were built. This resulted in an exodus of families of ever class seeking a better life in the suburbs. Often called "streetcar suburbs," the streetcar lines enabled suburban homeowners to commute to their places of business in the city's downtown and on the University of Wisconsin campus. The Nakoma Neighborhood was the first neighborhood to stretch beyond the reach of the streetcar lines. As the automobile became more accessible real estate developers we able to look further from the downtown for land to develop. Platted by the Madison Realty Company in 1915, it would take five years before sales of lots began to take off. During this time a number of restrictions and amenities were developed to create an appealing area for families. Saloon and businesses were forbidden as were multi-family dwellings. Lot setbacks and height restrictions were developed and all building plans required a review by a licensed architect. A private bus line was created to shuttle residents between Nakoma and the downtown and a new school was built. By the mid-1920's new houses were appearing on every street of the original plat. Replats of several blocks added to the number of available lots and construction continued unabated until the onset of the Great Depression. 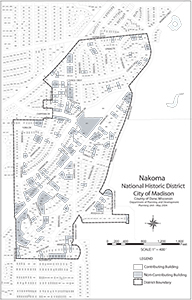 Nakoma was annexed into the City of Madison in 1931 and by 1936 construction resumed at a pace even greater than in the 1920's. By 1945 nearly all of the lots in the pre-WW II portions of Nakoma were occupied. 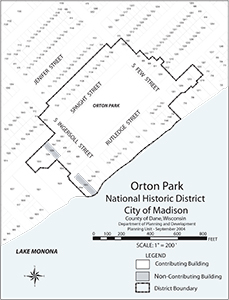 The block that now consists of Orton Park was established as Madison's first official burying ground. In 1846, just after Madison became a Village, trustees purchased the block to serve as the public cemetery. The City was growing slowly at the time and the 256 plots were expected to meet the Village's needs for the foreseeable future. Madison's population, however, began to boom around 1850. In the face of this influx of residents, plus a series of cholera epidemics, officials decided to purchase a much larger tract of land west of the Village and move the graves from the smaller cemetery to the new larger one. The original cemetery tract was converted to a City park, which opened in 1887 and became an attractive place for residential houses. Although a few houses were built near the cemetery in the pioneer era, the most intensive development occurred in one of Madison's boom periods, from the 1890s to the Depression. By the early 1930s all of the lots surrounding the park were filled. The Orton Park Historic District includes the park itself, the houses that face the park on all four sides, and some adjoining groupings of houses on Spaight and Rutledge Streets. Since most of the houses were built between 1890 and 1920, early twentieth century styles predominate. About one-third of the houses in the district are Queen Anne. Another third are progressive Craftsman and Prairie style designs. The park still serves as an attractive urban green space, and the focal point of the neighborhood. Sherman Avenue and its surrounding area were included in the original plat of Madison, drafted in 1836 for pioneer land agent and speculator, James Duane Doty. 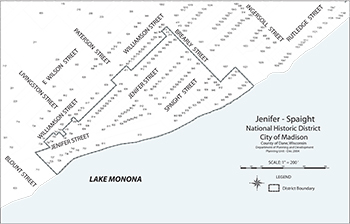 Following the shoreline of Lake Mendota, it was one of only a few streets that did not conform to the plat's rectangular grid pattern. Sherman Avenue was a scenic backwater and, indeed was sometimes under water, until the early 1890s when the City experienced its second period of rapid growth. It was during this period that the City's first suburbs were developed, and major filling of low lying land in the Sherman Avenue area became economically feasible. The Sherman Avenue historic district includes both sides of a five-block section of Sherman Avenue from Giddings Park to Tenney Park. This area was developed during the first era of Madison's suburban expansion, when streetcars made the ten-to twelve-block commute to downtown more tolerable. Nearly all the houses in the district were built as single-family homes for middle-class families. Since most of them were built between 1890 and 1920, early twentieth century styles predominate. Of the 80 houses in the district, about a third are Queen Anne or Shingle styles. Another third are Craftsman or Prairie styles, and the rest consist of period revival styles. This district is also significant for its concentration of residences designed by some of Madison's most important architectural firms, including Claude and Starck, Alvan Small, Gordon and Paunack, Law, Law and Potter and Frank Riley. Most of the houses in the district look very much like they did when they were built. Similar setbacks, heights, rooflines, and materials, combined with high historic integrity present a unified appearance and feeling throughout the neighborhood. The Simeon Mills historic district located at the corner of Main and King Streets, just off the Capitol Square, encompasses one, triangle-shaped block. It is composed of seven buildings, now divided into nine ownership lots. These buildings have a unity of scale and materials, enhanced by the fact that they are joined by party walls. The buildings were built between 1845 and 1887. Five of the buildings are Italianate in style and one is vaguely Romanesque. The Argus building, located on the corner of East Main and South Webster Streets was built in 1845 and is today the oldest known commercial building remaining in Madison. Today, there are small concentrations of 19th and early 20th century buildings still existing on the Square. 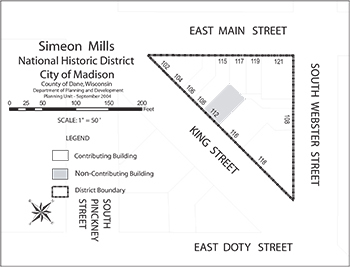 Because almost the entire block remains as it was in 1887, the Simeon Mills historic district retains better than any other section of Madison, the scaled and character of the downtown in the 19th and early 20th centuries. One of Madison's first suburbs, University Heights was platted in 1893. Located close to the University, its curvilinear streets and beautiful vistas attracted families of university professors and other business people. Some of Madison's most architecturally significant Queen Anne, prairie style and period revival houses were built here. Madison's finest architects, as well as nationally-known architects Keck and Keck, George W. Maher, Louis Sullivan and Frank Lloyd Wright, designed residences in the Heights. 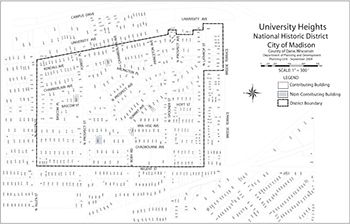 The Common Council designated University Heights as Madison's third historic district in 1985 at the request of neighborhood residents. Platted in three phases between 1903 and 1917 on open farmland without trees or buildings, this wedge-shaped district comprises twenty-three whole City blocks. 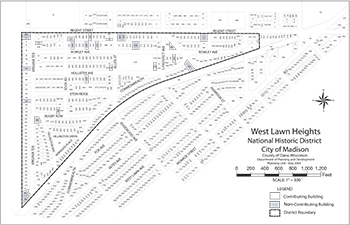 The West Lawn Heights district consists of almost 400 single-family homes, two commercial buildings, and two church-school complexes. Nearly all were built between 1906 and 1946. The three separate plats of the district present a unified appearance and rhythm because all three were designed and surveyed by Leonard H. Smith, a professor of civil engineering and city planning at the University of Wisconsin, and the developers established rules and restrictions in an attempt to guarantee physical and social attractiveness. historic evolution of the district and the surrounding City during that period. Most houses also retain a high degree of historic integrity. 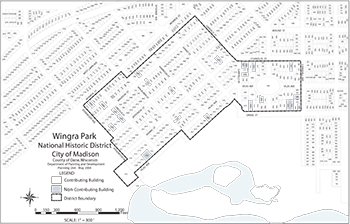 Platted in 1889, Wingra Park was the first of Madison's modern suburbs to be created in response to residents desires to escape the increasingly crowded conditions on the Isthmus. The 106 acre farm purchased for the neighborhood was a largely open, well-drained property that adjoined the western edge of the city. Sales of the lots were slow at first, stalled by a slow national economy and lack of street car service. In 1893 the Wingra Park Advancement Association was formed "to beautify and improve" Wingra Park. One of their first acts was to build a neighborhood center as a visible symbol of their community and a place where neighborhood activities could take place. By 1895 electric street lights were brought to the area and in 1897 the street car line was extended down Breese Terrace to Monroe Street and then on to Forest Hills cemetery. This act was the most important event in securing the success of the plat. 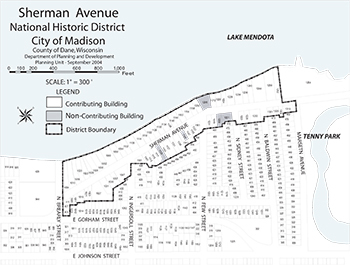 By 1903 this area was considered one of Madison's finest residential districts. The sizeable group of houses within this area contains some of Madison's finest Queen Anne, Prairie School and period revival homes. These buildings not constitute one of Madison's most important and intact architectural legacies.